All Products > "120026 HPI Racing Flux EMH-80A Brushless Wtrproof ESC"
With the capacity to handle 2S and 3S LiPo power, the Flux EMH-80A ESC is the perfect match for the #112850 MMH-4000KV 1/10th scale brushless motor. Complete waterproof protection means you can use your car equipped with the Flux EMH-80A in the wettest of conditions, or when the weather's warm, a large fan sits on top of the case inside a protective cover to keep things cool. • 1. Waterproof* and dust-proof. The ESC has been designed to work in wet conditions. a. 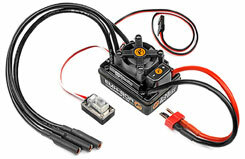 *Please remove the cooling fan when using the ESC very wet conditions. • 4. 3 running modes (�Forward with Brake� mode, �Forward/Reverse with Brake� mode, and Rock Crawler� mode).